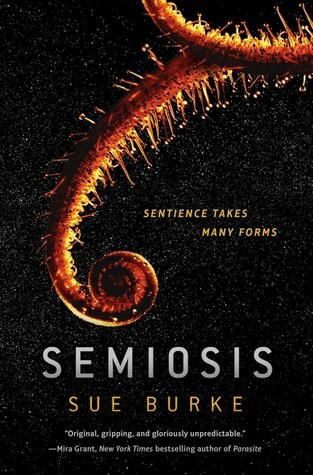 Semiosis is a multi-generational story that takes place over the course of many years, following a group of human colonists who have traveled light years from Earth to settle on a planet they dubbed Pax. The first pioneers, made up of mostly young scientists and activists who were saddened by the plight of their polluted and war-torn world, hoped to start over and establish a peaceful society on this newly discovered planet. However, they were wholly unprepared for the alien environment that awaited them, nor did they anticipate Pax’s bizarre flora and fauna and the surprising ways they interacted with their surroundings. Many of the original settlers died within a matter of weeks, but through the hard work and perseverance of the survivors, the colony managed to hang on and grow, giving rise to the next generation. Still, their difficulties were far from over. Despite the settlers’ lofty goals to live in harmony with the land, Pax’s plants and animals behaved in strange and unpredictable ways, causing the humans to adjust and alter their game plans on the fly. With every new generation also came new challenges, both biological and social, such as the problem of sterility in the population or the disagreements between the older members and the younger ones on how the colony should be run. Society adapted to the planet, and Pax adapted in turn. As someone fascinated with biology, my favorite aspect of Semiosis was the author’s portrayal of the plant and animal life on Pax. The world-building was phenomenal and extremely convincing, as though I was truly transported to an alien planet, encountering organisms that felt vaguely familiar and yet unlike anything I’d ever seen before. This sensation was at once unsettling and exciting. As fascinating as it was to watch how the zoological and botanical sciences were being applied, it would also be a mistake to assume that the natural rules on Earth would work on Pax—a lesson that the first-generation settlers learned the hard way. For example, many plants on Earth have evolved to form symbiotic relationships with other plants or animals. In the case of a bee flying from blossom to blossom, inadvertently fertilizing flowers by gathering pollen, one could argue that the plant had evolved in a way to “train” the insect into helping it. Semiosis explores this concept, except the story takes it even further. Because Pax is different from Earth, the plants on Pax have developed in some extraordinary ways. Semiosis also makes a lot of insightful observations about the nature of human behavior and the relationship it has with social systems. Earth colonists came to Pax hoping to create a utopia and avoid the mistakes of humanity’s past. In this perfect world, everyone would be treated and valued as equals, and they would also protect and respect the natural order of life on the planet. They quickly realized their hubris. Pax was simply too different, and despite all the humans’ hard work in their research and preparations, the native life on the planet did not behave in a way they expected. To ensure their own survival, the colonists were forced to rearrange some of their priorities. Nothing is black and white, and that’s what I loved about this book. Even the best laid plans—and the best intentions—could fall apart with the introduction of something completely new and weird and unanticipated. And on Pax, that’s pretty much everything. Of course, there’s also the matter of the book’s unique structure. Because it is made of a number of narratives told over several generations, Semiosis almost has the feel of a collection of short stories, though they do fit together to form a complete picture of the settlement process on Pax. As with most multi-generational stories, you’re not going to get the chance to know any one character intimately; instead, it’s the colony that takes center stage, and the reader is able to experience its development through the years by following one or two of its members in each generation. Each character has a unique perspective on the challenges the society is facing though, so while the names, faces, and situations will change, the book remains interesting. Still, if you know you are not a fan of multi-generational novels, then I doubt this one will work for you. Personally, I really enjoyed Semiosis. Admittedly, I hadn’t expected the multi-generation format, but I was pleasantly surprised at the intricate way this story was told, and how deftly Sue Burke managed to pull it all together. It was a joy watching the society on Pax evolve over the years, even when the settlers themselves struggled and dealt with some difficult obstacles and brutal conditions. Overall, I found it to be a very realistic depiction of human colonization on an alien planet, and I also admired many of the characters for trying to uphold their values even in the face of danger and despair. I would highly recommend this book for readers who are interested in a fresh and fun perspective on planetary exploration stories and space colonization sci-fi. Audiobook Comments: The audiobook edition of Semiosis was performed by Daniel Thomas May and Caitlyn Davies, and between the two of them they covered the half dozen or so perspectives featured in this novel. Considering these constraints, the narrators did very well, utilizing varied accents and inflections to portray the different characters of each generation so that each person felt like they had a distinct and unique voice. Yeah, I was impressed at the way she pulled it all together! I’m so curious to read this. I’m not sure the “multi generational” format is my favorite, but I love science as well, especially alien plant life. Reading soon, hopefully! This was a good review for the book! The first one I read, the reviewer wasn’t so much a fan, which I was very suprized about because I can usually tell if a book will be good or not from my interviews. Yeah, I really think it depends on how well you do with multi-generational novels. If you don’t like them, you definitely won’t like this! This book sounds made for me! Multi-generational planet colonization, hostile environment, science and characterization, all rolled into one… what’s not to like? My thoughts exactly! I really liked how we got to see the colony evolve over time! Not too many colonization sci-fi novels give such a complete picture. Yayyy biology! I’ll have to hurry up and get to this! I’m so looking forward to reading this one – not started yet because my reading plans have changed slightly but very soon so great to see such a positive review and it helps to go into a book sometimes with your expectations being tempered to what the read will be like. I’m curious about this one, and I’ll definitely grab it if it comes across my library. The biology aspect sounds awesome, but I don’t do well with multi-generational stories. There never seems to be enough plot for me. Yeah, if you don’t like multigenerational stories, then I wouldn’t recommend this! It makes a change to see something that isn’t part of a series with big cliffhangers!